This Ripjaws Series memory kit is designed specifically to complement the dual channel based chipsets, and eliminates data bottleneck by doubling your memory bandwidth. Optimized for speed, low latency and high stability, Ripjaws Series memory is the perfect solution to overall more responsive system. Dual-Channel DDR3 1600 Reaching the optimal balance between the sheer speed of DDR3 and low latency, this G.SKILL Ripjaws Series DDR3 memory kit is rated at 1600MHz 9-9-9-24 to provide ample computing capability to the Intel P67/Z68/P55 and AMD 790 Series/890 Series platforms. Pros: Easily popped into the memory slots. Win 10 and MB recognized the memory. Pros: I've used this memory set for seven years. There's nothing wrong with it. What more could I say? Other Thoughts: If you still need DDR3 after all this time, there's no reason to shy away from this set. Other Thoughts: I've had a set in my computer for at least 5 years, and never had a problem with it! Other Thoughts: This is my first build's ram and is still working 5 years in, can't say I ever had any problems with it. Pros: Easy to install. Perfect fit, form & function. This is an upgrade from a 4GB system to 16GB with the same type RAM. Other Thoughts: BUy this brand for your PC. You wont have to do it again. I have use my original RAM I purchased Oc'd for 8 YEARS !!!! Never a problem, & I will do the same to this RAM. Pros: Been in my pc for four years and it has outlived every part except my GPU. I feel like this ram will outlive me! Pros: I purchased this RAM for $24 in 2012 and it has been working perfectly with 0 issues for nearly 6 years. Never overclocked but at stock speeds it has been rock solid. Other Thoughts: At the current pricing its a tougher sell but if the price goes back down I would buy again. 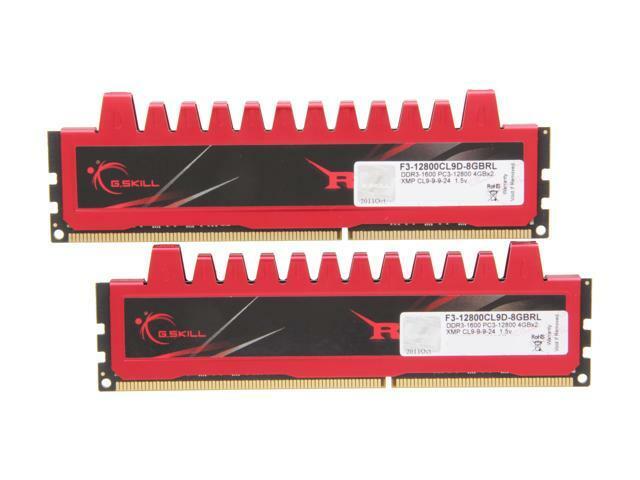 G.Skill has proven to be excellent RAM, especially for the price.